I absolutely love Griz. He and I are both from Detroit, so he is my hometown hero. I was able to meet him and get a picture with him at Electric Forest; he was such a chill and genuine guy, and I think most people see that in him. I have seen him perform four times; I saw him when he was still starting out and headlining a local show in Detroit. I’ve also seen him perform with Gramatik and Big Gigantic (as Big Grizmatik) in front of thousands of people at Electric Forest in Rothbury, Michigan. Griz has blown-up in the last year, and it’s been awesome for my friends and I to see him blossom for a popular local in Detroit to playing festivals all over the U.S. Last September Griz released his debut album, ‘Mad Liberation.’ ‘Mad Liberation‘ was a fantastic album, and it truly showcased how much talent the young producer has. It gained him a ton of exposure and allowed him to play at festivals and concerts all around the U.S.
Late this summer he announced that his second album, ‘Rebel Era‘ would be released sometime this fall. Well ladies and gentlemen that day has finally come. A few days before the release of the album, Griz released the song ‘Hard Times‘ and an accompanying video for it on Youtube. I fell in love with the song the first time I heard it, and the music video was amazing. The video was shot entirely in Detroit with a large amount of it showcasing his set on Day 3 at the Detroit Electronic Music Festival (DEMF) in the spring. This spring was my 4th year at DEMF, and it was an epic final day of the festival. It rained on and off all day, and Griz played the Electric Forest Stage from 9:40 to 11:00. During this time the weather changed from a light drizzle to pouring rain. However, everyone stayed for his set and raged in the rain; it was truly an incredible experience. Watching the music video for ‘Hard Times’ brought back so many good memories from that day and weekend, and it reminded me of how proud of Griz we all are in Detroit. Two days ago on October 15 Griz released the full album ‘Rebel Era‘ for free download on his website. As soon as I heard that ‘Rebel Era’ was released I sat down in my apartment and blasted the entire album on my stereo system. I loved ‘Mad Liberation’ so I was really hoping that ‘Rebel Era’ would not disappoint. Big surprise: it did not disappoint at all, and it was still better than I expected! The songs are still funky as hell, and we get a taste of a whole new catalog of electro-groove/funk hop (that’s the only way I can describe it) songs from Griz. Also for those of you who aren’t familiar with him, he plays saxophone on many of his tracks. The album also has special appearances by The Floozies and Dominic Lalli, who is one-half of Big Gigantic. The album still has the signature Griz feel, but he does branch out and try some new styles which was exciting to see. For example, ‘Crime In The City‘ is a banging fidget/electro-house track that sounds similar to something a young Skrillex, Porter Robinson, or Le Castle Vania would cook up. Also the song ‘Keep The Dream Alive‘ explores a drum and bass side that I’ve never seen of Griz. The first track on the album, ‘Gettin Live‘ was released as a free download months ago, and I did not know that it would be on the album; that was a nice surprise because that’s a perfect track to start the album with. Personally my favorite tunes on the album (in no particular order) are Gettin Live, Hard Times, Dance With Me, Crime In The City, Keep The Dream Alive, and DTW to the DIA. If you liked ‘Mad Liberation’ then you will definitely like ‘Rebel Era’ and hopefully you enjoy it even more. 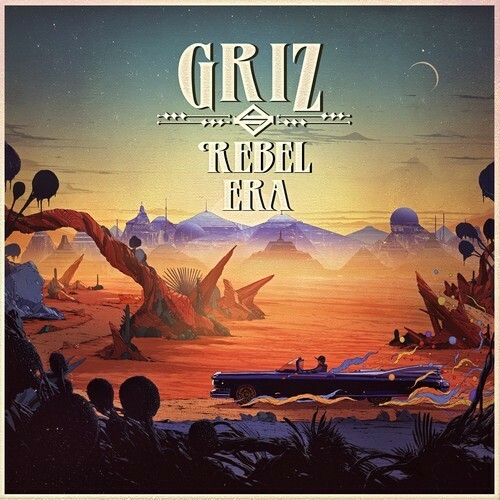 If there’s one album you listen to this fall, make sure it’s ‘Rebel Era’ because Griz never disappoints and always gives it 110%. Also, Griz is awesome enough to give away the album for free on his website, so be sure to download it too! He’s going on his first big tour this fall, so he may be coming to a city near you. If he does, it would be a sin not to go to it and get your funky electro groove on with his music. I have a feeling that Griz has only shown us a small glimpse of what he’s really capable of because he is set to do much bigger things in the future. Griz is becoming the next big thing in EDM, and I hope you’ll join me by supporting him every step of the way.